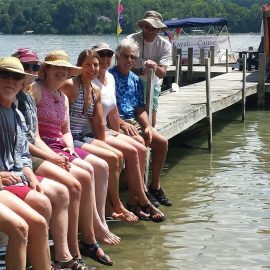 For eleven years now, Kayak for a Cause on Walloon Lake has brought together avid paddlers and lovers of the outdoors to share in a fun and unique event that not only showcases the beautiful lake that Camp Daggett calls home, but also helps support a worthy cause. In our 11th year we invite you to join our kayaking team, and take part in this great event with the goal of raising dollars in support of the Camp Daggett Adventure Center (CDAC) and it’s student programs. Please consider supporting this great event, or join in the fun yourself as we paddle around the pristine waters of Walloon Lake on July 20 & 21, 2019. This non-competitive event takes place over the course of two days and provides each participant with optional challenges to keep you on your toes. Paddlers can choose to participate both days and circumnavigate the entire lake, or join the team for just one day, if that is a better fit for you. While on the lake, participants can expect to explore the beautiful shores, take short rest stops along the way and maybe even a quick dip to cool off in the wonderful blue waters of Walloon Lake. Additionally, paddlers will have the aide of a support boat on their journey, full of snacks, water and other goodies to keep the team energized on their tour.